RSVP seeks to enrich the lives of volunteers, age 55 and older, through meaningful service opportunities that match their life skills and interests to community needs. The Retired and Senior Volunteer Program (RSVP) of Rock County, Inc. is one of 17 Wisconsin Programs sponsored by the Corporation for National and Community Service. Nationally there are over 760 RSVPs with over 460,000 volunteers. Rock County RSVP was organized in 1973. It was sponsored locally by Voluntary Action Center. In 1987, RSVP became incorporated in the State of Wisconsin as an independent non-profit agency. Involve senior volunteers in planning and decision-making in programs, on community boards and committees. Increase public awareness concerning contributions and needs of older adults. Improve the image of aging. 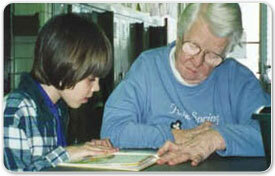 Provide opportunities for intergenerational projects and activities. Offer senior volunteers the opportunity to make a positive impact in their communities.